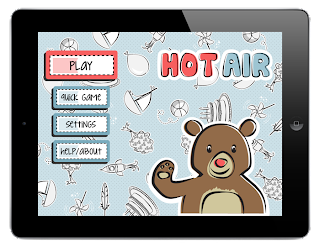 HotAir is an iPhone/iPad app that was created by a speech and language pathologist who wanted an app that gave measurable results, was fun, and built in repetition, rehearsal, and reinforcement of skills; and a dad of three preschoolers with an intrinsic and irrepressible sense of wonder. The result is an app that will work well as a therapy tool, but is also a whole lot of fun! You may be required to blow leaves off a tree, blow a ball across the screen, etc. and when the goal is met there will be a party effect with confetti and many congratulations. The app is intended to help improve breath support, but is so fun that you may want to play just for the game itself. It can help build abdominal grading and expiratory volume, control and duration. It can help build breath support for words and phrases. It can be an entertaining adjunct to respiratory therapy. Clients who have had a tracheotomy can use this app as a tool to learn or relearn to use their respiratory mechanism once the trach is removed or a speaking valve is inserted. It can teach the difference between inhalation and exhalation. It can help teach awareness and control of nasal resonance and emission. It is intended to help improve the S-Z ratio—airflow with and without voicing. The app can be used to teach turn taking, language skills, visual scanning, etc. Or, like many others, you may just want to play the game and enjoy the app! Blow into the microphone on your device. If you are having difficulty, adjust the audio sensitivity settings according to the noise level of the environment you are in. If you are still having difficulty, try blowing through a straw which is aimed at the microphone on your device. As you get better, change the settings and eliminate the straw. In the Play mode, the user selects the number of rounds and round length. After all of the rounds are completed, basic statistics are shown. Try to raise your stats each time you play! If you don’t have a lot of time, try a quick game. The rounds will gradually get harder or easier based on how well you did in the current round so that the app is always challenging and yet success is guaranteed.